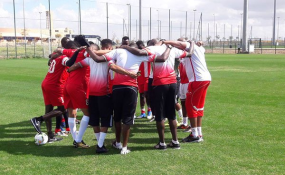 Harambee Stars players (file photo). A rampant Harambee Stars utterly dominated and destroyed a sorry Ethiopian side 3-0 on Sunday at a full to capacity Kasarani stadium in a pulsating 2019 Africa Cup of nation qualifying match. The huge victory, coming just days after Stars held the Ethiopians to a barren draw in Bahir Dar, massively enhanced Kenya's chances of qualifying for the biennial continental showpiece to be held next year in Cameroon. After a prolonged spell of dominance in the opening minutes, Michael Olunga opened the scoring for Stars in the 23rd minute with a sumptuous left foot curler from the right flank after a neat one-two with Eric Johanna. The goal practically brought down the roof at Kasarani. But even before the fans could calm down, Kenya struck again in the 27th minute. This time it was Johanna with a thunderous left foot shot from the edge of the box after the Ethiopians failed to clear their lines from Eric Ouma's spadework on the left. Olunga almost netted a brace five minutes after restart after dispossessing goalkeeper Samson Assefa only for his goal-bound shot to be cleared by Ahmed Rashid for a fruitless corner. But things only got from bad to worse for the Ethiopians. In the 64th minute Johanna drew a penalty after being clearly felled inside the box. Up stepped skipper Victor Wanyama, who converted the spot kick with aplomb, sending the Ethiopian goalkeeper the wrong way. At the final whistle, with the Ethiopians beaten and broken, a big party erupted at Kasarani. Victory for Kenya, their 15th in 44 meetings against the 1962 continental champions takes their points tally to seven points in Group F, ahead of four-time African champions Ghana (3 points) and Ethiopia who remain on one point from three matches. Should Sierra Leone, who are currently suspended by Fifa, fail to comply with the demands of the world football governing body by the time the fifth round of matches come around, then they will be expunged from the qualifiers hence sending Kenya through after a 14-year hiatus. Kenya lineup: Patrick Matasi (GK), Philemon Otieno, Musa Mohammed, Brian Mandela, Abud Omar, Erick Ouma, Victor Wanyama (Johanna Omolo 71'), Dennis Odhiambo, Eric Johanna (Ismael Gonzalez 83'), Francis Kahata, Michael Olunga.